How can I get income from youtube quickly? Home › Youtube › How can I get income from youtube quickly? How do I get income from youtube ? Get large amounts of money from Youtube need dedication, passion and hard work, not everyone is able to do so. I say this, certainly not aims to loosen your spirit, but you want to remain realistic, so as not to upset on the way, prepare yourself early on to work harder presents videos that are creative, unique, watchable and likeable people all over the world! But, if other people can, not a thing is impossible You become one of those ' lucky ' next, doesn't it? Click the profile picture on the top right corner of the page. Then click settings for Youtube. Type the name of the channel You want. The name must only be letters and numbers, there should be no spaces. If it is, then the address of Your channels into a more concise, such as: http://www.youtube.com/user/naldojhon. Better than a long address like the one above isn't it? 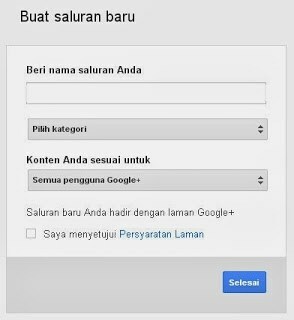 Keep in mind, with one Google account, you can create a lot of special channels on Youtube. Suppose you are creating a channel for the news category, the other for music and more. It Is Up To You. For each channel, You can then create a url address specifically each. In the same way as the steps above. Please specify the age limit for the specified content, all users, over 18, 21 years and above, or alcohol related content. Check the agreed Requirements page, and then click Finish. My advice, if You have video content with different categories, both in terms of the type of content, as well as in terms of the age limit, we recommend that you create a new channel. Do not stir so mixed one. This will make the channels you get better performance. To switch between channels, live click your profile photo, click the Switch the account, and select the channel which you want to enable. Or you can click All my channels, to display all the channels you have. Okay, now you have the channels and has already given a special url which is more concise. I suppose you've already uploaded one or two videos to Your channel. The next step is to enable monetization channel for You after, that is, in other words we allow Google to display ads on videos we have. Go to the dashboard page > > > > Channel Settings feature, or click this link. Click Activate My Account. Later the Agreement page open long enough (read all please, nor does anything, hehehe ...). Just check all Your sign, agree, and then click the I accept button. After it appeared the choice of ad format will be displayed. Here, you specify the type of what ads will show up later. The overlay ads in the video is in the form of elongated ad that will appear at the bottom of your video, that when clicked then you will get paid. While True-view advertising options in the flow, is the video ads will be rotated automatically before the videos You watched. You can choose one, could also choose both. If you have already click the monetization. Well, now the channel you are already enabled for dimonetisasi and you now have become a Youtube Partner. The choice of this type of advertising, you can adjust or Fox then. Make sure you monitor the performance of your earnings until you find the most suitable types of ads with your own videos. Usually the ads in the form of tutorials, products, the company is more suitable to use this type of Stretch, while video entertainment is more suitable to use the video kind of True-view. This is related to the behavior of the audience that is different from the type of videos each. Up here, if you already have some video, then the video will be automatically dimonetisasi, having reviewed in a short time, then it means you've already started collecting revenue coffers from Youtube. In addition you can also select your own video anywhere who want to dimonetisasi. Go to the page of the video Manager > > uploaded. Check the video which one to dimonetisasi, click actions continue to select the monetization. Or it could be a direct click logo $ small on the right of the video in question. Signs that a video has been approved for $ dimonetisasi is the logo changed to green color as shown in the picture above. Update: now the logo $ turned blue. If all the above stages has you do, then you directly collect income. And now it's time You receive payment. Keep in mind, to receive payment of the income from Youtube, you need an Adsense account associated with your Youtube account. So, you should make your Adsense account at any one given point. Google will not enjoin you immediately create an Adsense account, except the acquisition of income You have approached the threshold payment, i.e. for $100. Even if you don't have an Adsense account, your income will continue to be computed and stored. As long as you are not hooking your Adsense account, then the report is yet to appear on the revenue page Analytics. So, as the animator you can quickly create an Adsense account then Your Yotube account is linked to. Explanation of how to get your Adsense account, you can read on the Google Support page. However, it's good I explain well here. Go back to the page Settings such as Channels in the second step above. You notice, after enabling monetization channels, then on the page appears the Channel Settings sub menu new monetization. In the section on how I would be paid, click the link to associate your Adsense account (see picture above). You will be taken to a page notification that you will associate your Adsense account, click the next button. Afterwards you will be redirected to the page of Google Adsense. If you want to use the same email address used to Youtube, click Yes, use [your email address]. You go to the second step. Here's just a confirmation to make sure Your Youtube Channel address. Click Continue. Entry to the third step. Complete all of the form correctly and completely. Carefully again before pressing the Submit my application. After this, you will be redirected back to Youtube. Wait some time, then you already have an Adsense account associated to Your Youtube Channel. Completed. Now you can see income from day to day. Whether the task is over and I will get money from Youtube? Hmm ... up to here, you are just starting out. The next task (this is the heaviest) is how to make your videos became popular, as many people watched. The more watchable people, then Your revenue opportunities will be even greater. Unfortunately there is no surefire formula of how to make a video of our well-known and popular. However, even so, at least we know some of the things that makes our video search, watchable and likeable person. Original, original, other than the other. You will not become a ' Star ' who make a lot of money from Youtube by way of copy and mimic other people's content. Maybe you just get a surge in earnings by following the trends of the moment are booming, but remember it's only for a moment. Not for long. In a long time it will not work. This is the crucial time, whether people will continue to watch or stop up there and then open the other video. Make people stay to watch your video until it is finished. These targets must achieve. The more channels You subscribe to, the greater the chances of getting great results from Youtube. To attract customers, you have to have new content on a regular basis. Have 5 videos, it feels extremely heavy could make money from Youtube in a hefty amount. Keep creating, create a helpful, interesting videos to be shared, and then serve to your customers! Well, that's the stages that you need to do to enjoy revenue from Youtube, along with some tips to maximize revenue. perampok google: How can I get income from youtube quickly? "clickable"